High-end streetwear designer, daniel patrick, and STARTER Black Label, the premium athletic brand owned by Iconix Brand Group, launch their collaboration of a 90’s inspired Holiday collection tomorrow, November 9. Daniel, a long-time fan of STARTER, was a natural partner for the brand, that first pioneered the fusion of sportswear and popular culture. Since its launch in 1971, STARTER has partnered with major sports leagues across baseball, football, hockey, and basketball, and just announced it will be the official on-field apparel and game day uniform supplier for the newly formed Alliance of American Football league. daniel patrick has recently contributed to the immersion of star athletes in the fashion industry, even creating custom looks for Antonio Brown, Draymond Green, Chris Paul and Matt Kemp. The combination of Daniel’s modern designs with STARTER‘s classic style results in a seamless blend of nostalgia and innovation. Daniel Patrick celebrated the launch of the 11-piece collection at a recent event at his Melrose Store hosted by NBA Trainer, Chris Brickley. 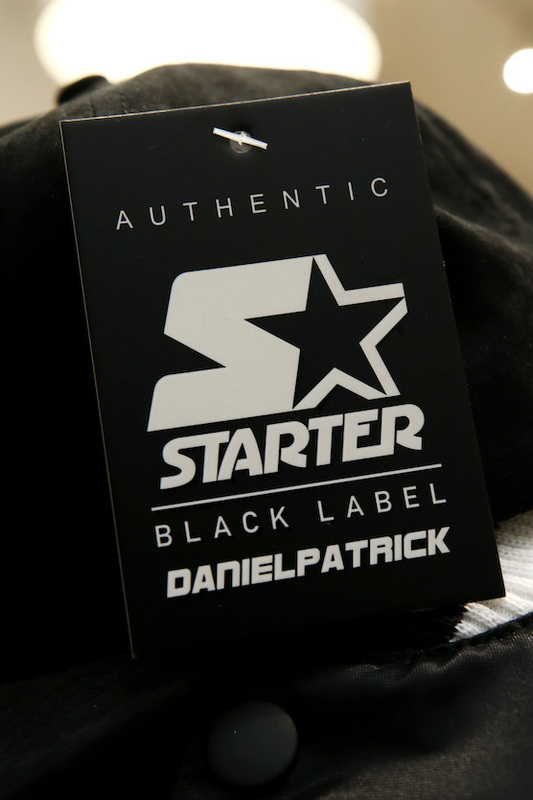 Hypebeasts, shoppers and influencers shopped daniel patrick X STARTER Black Label logo hoodies, long and short-sleeve t-shirts, snapbacks, tracksuits, and windbreakers. Standout styles included the infamous satin STARTER jacket, re-imagined in monochrome with DP in varsity lettering and Daniel’s renowned contrasting stripe design. Track pants and shorts incorporate daniel patrick’s tape detailing along the sides and STARTER‘s logo displayed across the front in block lettering. The color pallete mixes bright reds, blues, and neon yellows on black and grey. Officially launching on November 9th, the collection will be available for purchase at Daniel Patrick’s Melrose Store, Wish ATL, and DTS Chicago with prices ranging $80-$600.